The discovery of an "early modern human" dating from 40,000 years ago in a cave outside Beijing, and a comparison of the individual's DNA with that of populations around the globe, are providing new pieces in the puzzle of how Homo sapiens left their African origins to expand across the continents. DNA extracted from the Tianyuan Cave dweller indicated he was genetically related to today's Amerindians, said FU Qiaomei, Institute of Vertebrate Paleontology and Paleoanthropology (IVPP), Chinese Academy of Sciences in Beijing, one of the scientists who led the study at Germany's Max Planck Institute for Evolutionary Anthropology. This Tianyuan fisher-gatherer is one of the earliest H. sapiens ever uncovered in China, she said in an interview. Fu was part of an international team that sequenced DNA from the anatomically modern human, created a genetic profile, and matched it against profiles of people now living in Africa, Europe and Asia. 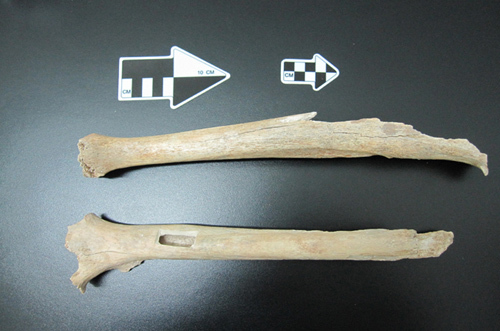 "The Tianyuan individual," Fu and colleagues wrote in a scientific journal, "derived from a population that was ancestral to many present-day Asians and Native Americans." That means, she explained in the interview, that the group of early modern humans represented by the Tianyuan individual could have been the genetic ancestors of populations now spread out across East Asia and the Americas. It is possible, she added, that the descendants of these Tianyuan H. sapiens were among the first humans to cross the intercontinental Bering land bridge to explore and populate the Americas when the Northern Hemisphere's glaciers began to recede during the last Ice Age. That would be the most logical explanation for the genetic similarities between the Tianyuan individual and living Amerindians, added Fu, who worked with researchers from the IVPP on the study. For decades, paleoanthropologists have been examining the anatomy of early humans, along with stone tool technology and/or cultural artifacts found at excavation sites scattered across the continents, to piece together the routes H. sapiens took out of Africa in the first waves of migration. But now, genetic information extracted from some of the best-preserved ancient humans, and a focus on evolutionary DNA changes that have appeared across the ages, are speeding up the effort to map these dispersals of Homo sapiens and of more archaic species. How Did Homo Sapiens Arrive in China? Nearly a century ago, the discovery of an array of 500,000-year-old skulls of the ancestral species Homo erectus in a cavern outside Beijing led some archaeologists to posit that China might have been the origin of modern humans. But later excavations across Africa uncovering the full spectrum of evolution - from 2-million-year-old precursor species to modern humans - have led to a consensus that H. sapiens arose in Africa alone, and then expanded outward, perhaps via the Sinai Peninsula into Asia. Chris Stringer, research leader in human origins at the Natural History Museum in London and one of the earliest backers of this "Out of Africa" model, said in an interview that early modern humans displayed a strengthening propensity to explore and expand. By 45,000 years ago, they began steadily moving along the coasts of Asia, and had developed the nautical technology to launch forays within the waters of the Red Sea, the Arabian Sea, and beyond. "As for the dispersion across/around mainland Asia I think an initial coastal dispersion was most likely, followed by movement inland along river courses," he explained. By at least 42,000 years ago, H. sapiens had begun to colonize Australia, although they might have arrived at the remote southern continent via "accidents of dispersion where targeted trips were taken off course by currents and storms," Stringer said. Early modern humans likely began exploring and settling along the southern and eastern coasts of China by the same time. They might have navigated Asia's coastlines via a combination of trekking along the shore and using small boats or rafts, said TONG Haowen, an IVPP professor who led the initial excavation of the Tianyuan Cave. Meanwhile, Fu and fellow researchers discovered during their DNA analysis of the Tianyuan early modern human that he carried a genetic component related to the Neanderthals. The Neanderthals were a close sibling species to H. sapiens that evolved from a common ancestor and populated parts of Europe and Asia during the Ice Age. No archaeological evidence has ever been uncovered of Neanderthals settling in Africa. "The Neanderthal genetic component in the [Tianyuan] early modern human was likely due to interbreeding after early modern humans had left Africa and overlapped with Neanderthals in the Middle East, before splitting into separate groups heading toward what are now Europe and East Asia," explained Fu. Fu and other scientists compared the DNA of the Tianyuan human with the genome of the now-extinct Neanderthal that the Max Planck Institute helped sequence and publish in 2010. The initial decoding of the Neanderthal genome and comparison with present-day populations around the world revealed that all contemporary humans outside of Africa carry a genetic component of up to 4 percent matching the Neanderthal's DNA; Fu said the Tianyuan individual displayed a similar proportion of "archaic admixture." Erik Trinkaus, who led an earlier Tianyuan study, said the find helped prove that as they began expanding beyond Africa, "modern humans spread and mixed with regional groups of archaic humans – what we call Neanderthals." An early advocate of the view that H. sapiens assimilated Neanderthals via gene flows in early encounters, Trinkaus said advocates of the alternative viewpoint – that modern humans completely "replaced" Neanderthals – were continuing a century-long prejudice against the sister species. More than 50,000 years ago, Neanderthals, like H. sapiens, transformed beach shells into decorative beads, painted them, and engaged in other forms of symbolic behavior, added Trinkaus, a paleoanthropologist at Washington University in Missouri. During millennia of encounters in the Middle East, Neanderthals and H. sapiens connected up not only genetically, but also quite likely linguistically, according to researchers at the Max Planck Institute for Psycholinguistics in the Netherlands. In a just-released study, scholars Dan Dediu and Stephen Levinson state there is "a broad range of evidence from linguistics, genetics, paleontology, and archaeology clearly suggesting that Neanderthals shared with us something like modern speech and language." And just as early modern humans outside of Africa carried a genetic component from the Neanderthal due to interactions and interbreeding in the Middle East, these H. sapiens also might have retained linguistic traces of these exchanges as they expanded across Asia, and then the Americas, Dediu said in an interview. It is possible, he added, that remnants of speech originating with the Neanderthals have survived into present-day languages. Despite the evidence that H. sapiens and H. neanderthalensis intermixed culturally and genetically when their populations overlapped more than 40,000 years ago, it remains unclear whether the twin lineages predominantly cooperated or contended for territory and natural resources as they spread out across western Eurasia. Could these once-intertwined branches of humanity have engaged, via stone weaponry, in the world's first arms race? Could the rising successes of the early modern humans as they extended their reach across Asia and Europe have contributed to the fall and extinction of the Neanderthals? All these issues await potential resolution in the future, Fu said. Meanwhile, Zhonghe Zhou, director of the Institute of Vertebrate Paleontology and Paleoanthropology, part of the prestigious Chinese Academy of Sciences, said the IVPP is creating a joint laboratory with the Max Planck Institute for Evolutionary Anthropology focused on paleogenetics. The new lab will sequence any genetic information recovered from ancient humans and Pleistocene mammals like the wooly mammoth that have become extinct. But there are limits on how far back in time these attempts at genetic reconstruction can go. "Until recently," Zhou said, "no DNA had ever been recovered from fossils that are more than 100,000 years old." But he added: "A Nature report last week on the sequencing of a complete horse genome from a bone dating to around 700,000 years ago seems to have significantly extended the known limit of DNA retrieval thanks to new technology and exceptional preservation, thus providing the prospect of conducting DNA studies on more ancient fossils."